The following article, edited by Frank Moore, was published to honor the fiftieth anniversary of the bombardment and fall of Fort Sumter. 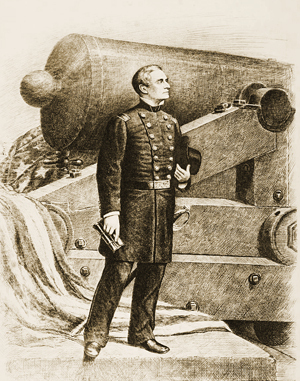 In the history of the Southern conspiracy, General Robert Anderson must hold a distinguished place, being the first federal officer against whom the fatal thought of rebellion took voice in the throat of a cannon; and though his shattered health has constrained him to play no further part in the tragedy which he opened with such brilliancy, his loyalty to “Old Glory,” his wise courage and Christian firmness, in that hour of peril, will ever keep his name honored and revered among the American people. General Anderson came from a patriotic and military family. His father, Captain Richard C. Anderson, was the man whose little band surprised an outpost of the Hessians at Trenton, on the night prior to the decisive battle of that place—an attack which the Hessian commander, Colonel Rahl, then on the lookout for Washington, construed to be the whole assault against which he had been warned. General Washington met Anderson retreating with his Company, and was very indignant at what they had done, fearing it would prepare the enemy for their advance in force. The result, however, proved the contrary, and Anderson was then complimented on the exploit. 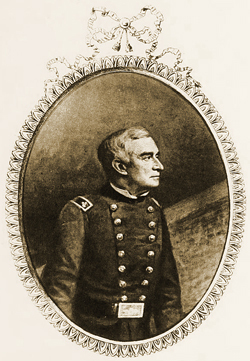 Captain Anderson served with Washington throughout the New Jersey campaign. The subject of this sketch–Robert Anderson–is a native of the state of Kentucky. The blood of a brave soldier ran in his veins and displayed itself in his early desire to adopt the profession of arms. Passing over young Anderson’s preliminary studies and scholastic successes, we find him, in 1832, acting Inspector General of Illinois Volunteers in the Black Hawk War. He filled this situation with credit to himself, from May until the ensuing October. In the following June 1833, he was made First Lieutenant. From 1835 to 1837 he occupied the responsible post of Assistant Instructor and Inspector at the United States Military Academy. He was assigned to the staff of General Winfield Scott as aide-de-camp in 1838, and in 1839 published his Instructions for Field Artillery, Horse and Foot, arranged for the Service of the United States—a hand-book of great practical value. Lieutenant Anderson’s service during the Indian troubles was acknowledged by a brevet captaincy, April 2, 1838. In July of the same year, he was made Assistant Adjutant General with the rank of Captain, which he subsequently relinquished on being promoted to a captaincy in his own regiment, the Third Artillery. In March 1847, he was with his Regiment in the Army of General Scott, and took part in the battle of Vera Cruz; being one of the officers to whom was entrusted, by Colonel Bankhead, the command of the batteries. This duty he accomplished with signal skill and gallantry. He remained with the Army until its triumphant entry into the Mexican Capital the following September. During the operations in the valley of Mexico, Captain Anderson was attached to the brigade of General Garland which formed a portion of General Worth’s Division. In the attack on El Molino del Rey, September 8, Anderson was severely wounded. His admirable conduct under the circumstances was the theme of praise on the part of his men and superior officers. Captain Burke, his immediate commander, in his dispatch of September 9, said: “Captain Robert Anderson (acting field officer) behaved with great heroism on this occasion. Even after receiving a severe and painful wound, he continued at the head of the column, regardless of pain and self-preservation, and setting a handsome example to his men of coolness, energy and courage.” General Garland speaks of him as being “with some few others the very first to enter the strong position of El Molino;” and adds that “Brevet Major Buchanan, Fourth Infantry, Captain Robert Anderson, Third Artillery, and Lieutenant Sedgwick, Second Artillery, appear to have been particularly distinguished for their gallant defense of the captured works.” In addition to this testimony, General Worth directed the attention of the Secretary of War to the part Anderson had taken in the action. He was made Brevet Major, his commission dating from the day of the battle. In the year 1851, he was promoted to the full rank of Major in the First Artillery. It was while holding this rank and in command of the Garrison of Fort Moultrie, that the storm which has so devastated this fair land first gathered strength and broke upon us. On the 20th day of December 1860, the state of South Carolina declared itself out of the Union. The event was celebrated in numerous Southern towns and cities by the firing of salutes, military parades, and secession speeches. At New Orleans a bust of Calhoun was exhibited, decorated with a cockade, and at Memphis the citizens burned Senator Andrew Johnson in effigy. The plague of disloyalty overspread the entire South. In the meantime, while the commissioners from South Carolina and the plotting members of Congress from the Border States were complicating matters with a timid and vacillating President Buchanan, Major Anderson found himself with less than one hundred men, shut up in an untenable fort, his own government fearing to send him reinforcements. Cut off from aid or supplies, menaced on every side, the deep murmurs of war growing louder and more threatening, the position of Major Anderson and his handful of men became imminent in the extreme. At this juncture of affairs, the brave soldier gave us an illustration of his forethought and sagacity. One sunny morning crowds of anxious people fringed the wharves of Charleston, watching the mysterious curls of smoke that rose lazily from the ramparts of Fort Moultrie, and floated off seaward—smoke from the burning gun-carriages. 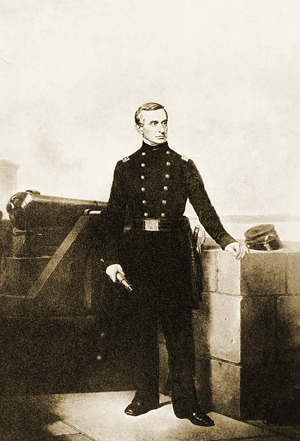 On the night previous, Major Anderson had quietly removed his men and stores to Fort Sumter, the strongest of the Charleston fortifications, and the key of its defenses. The deserted guns of Moultrie were spiked and the carriages burned to cinders. The evacuation of the fort commenced a little after sunset. The men were ordered to hold themselves in readiness, with their knapsacks packed, at a second’s notice; but up to the moment of their leaving they had no idea of abandoning the post. They were reviewed on parade, and then ordered to two schooners lying in the vicinity. The garrison flag unwound itself to the morning over Sumter. The rage of the South at this unexpected strategic maneuver was equaled in its intenseness only by the thrill of joy that ran through the North. Major Anderson and his command were safe, for the time being, and treason disconcerted. The sequel proved his prudence. Having all the forts of the Harbor under his charge, he had, necessarily, the right to occupy whatever post he deemed expedient. He did his duty, and he did it well. His course was sustained in the House of Representatives, January 7, 1861. Before the first burst of indignation had subsided, Fort Moultrie was taken possession of by the South Carolinians, and carefully put into a state of defense. The rebel convention ordered immense fortifications to be built in and about Charleston Harbor, to resist any reinforcements that might be sent to Major Anderson. Strong redoubts were thrown up on Morris and James Islands, and Fort Moultrie, Johnson and Castle Pinckney, stood ready to belch flame and iron on the devoted little garrison. Sumter was invested; no ship could approach the place in the teeth of those sullen batteries. On the 8th of April, information having been given by the United States Government to the authorities of Charleston that they desired to send supplies to Fort Sumter on an unarmed transport, they were informed that the vessel would be fired upon and not allowed to enter the port. The United States Government then officially advised the insurgents that supplies would be sent to Major Anderson, peaceably if possible, otherwise by force. Lieutenant Talbot, attached to the Garrison at Fort Sumter, and bearer of this dispatch, was not permitted to proceed to his post. The steamer Star of the West was signaled at the entrance of the harbor on the morning of the 9th. She displayed the United States Flag, but was fired into repeatedly from Morris Island’s battery. Her course was then altered, and she again put out to sea. The formidable floating battery, constructed and manned at Charleston, was taken out of dock on the evening of the 10th and anchored in a cove near Sullivan’s Island. About seven thousand troops now crowded the earthworks and forts under command of General G.T. Beauregard. The report that a fleet lay off the bay, waiting for a favorable tide to enter the harbor and relieve the fort, caused the greatest excitement in Charleston. On the afternoon of April 11, Colonel Chestnut and Major Lee, aids to General Beauregard, conveyed to Fort Sumter the demand that Major Anderson should evacuate that fort. Major Anderson refused to accede to the demand. On being waited on by a second deputation (April 2, 1:00 a.m.) desiring him to state what time he would evacuate, and to stipulate not to fire upon the batteries in the meantime, Major Anderson replied that he would evacuate at the noon of the 15th if not previously otherwise ordered, or not supplied, and that he would not in the meantime open his fire unless compelled by some hostile act against his fort or the Flag of his Government. At 3:30 a.m. the officers who received this answer notified Major Anderson that the batteries under command of General Beauregard would open on Fort Sumter in one hour, and immediately left. The sentinels on Sumter were then ordered in from the parapets, the posterns closed, and the men directed not to leave the bomb-proofs until summoned by the drum. The Garrison had but two days’ rations. 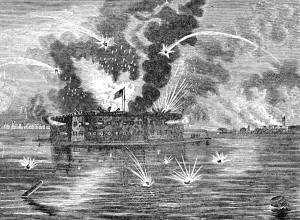 At 4:30 Friday morning, fire was opened upon Fort Sumter from Fort Moultrie, and soon after from the batteries on Mount Pleasant and Cummings Point, then from an unsuspected masked battery of heavy columbiads on Sullivan’s Island. It soon became evident that no part of the beleaguered fort was without the range of the enemy’s guns. A rim of scarlet fire encircled it. Meanwhile the undaunted little band of seventy true men, took breakfast quietly at the regular hour, reserving their fire until 7:00 a.m., when they opened their lower tier of guns upon Fort Moultrie; the iron battery on Cummings’s Point, the two works on Sullivan’s Island and the floating battery, simultaneously. When the first relief went to work, the enthusiasm of the men was so great that the second and third reliefs could not be kept from the guns. The rebel iron battery was of immense strength, and our balls glanced from it like hail-stones. Fort Moultrie, however, stood the cannonading badly, a great many of our shells taking effect in the embrasures. Shells from every part burst against the various walls of Sumter, and the fire upon the parapet became so terrific that Major Anderson refused to allow the men to work the barbette guns. There were no cartridge bags, and the men were set to making them out of shirts. Fire broke out in the barracks three times and was extinguished. Meals were served at the guns. At 6:00 p.m. the fire from Sumter ceased. Fire was kept up by the enemy during the night, at intervals of twenty-five minutes. At daybreak the following morning the bombardment recommenced. Fort Sumter resumed operations at 7:00 a.m. An hour afterward the officers’ quarters took fire from a shell, and it was necessary to detach nearly all the men from the guns to stop the conflagration. Shells from Moultrie and Morris Islands now fell faster than ever. The effect of the enemy’s shot, on the officers’ quarters in particular, was terrible. One tower was so completely demolished that not one brick was left standing upon another. The main gates were blown away, and the walls considerably weakened. Fearful that they might crack, and a shell pierce the magazine, ninety-six barrels of powder were emptied into the sea. Finally the magazine had to be closed; the material for cartridges was exhausted, and the garrison was left destitute of any means to continue the contest. The men had eaten the last biscuit thirty-six hours before. They were nearly stifled by the dense, livid smoke from the burning building, lying prostrate on the ground with wet handkerchiefs over their mouths and eyes. The crashing of the shot, the bursting of the shells, the falling of the masonry, and the mad roaring of the flames, made a pandemonium of the place. Strangely enough but four men had been injured, thus far, and those only slightly. Toward the close of the day, ex-Senator Wigfall suddenly made his appearance at an embrasure with a white handkerchief on the point of a sword and begged to see Major Anderson, asserting that he came from General Beauregard. “Well sir!” said Major Anderson, confronting him. 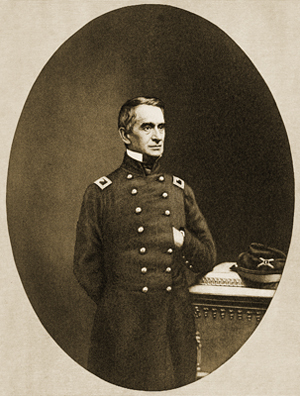 General Wigfall, in an excited manner then demanded to know on what terms Major Anderson would evacuate the post. The Major informed him that General Beauregard was already advised of the terms. “On those conditions,” replied Major Anderson. 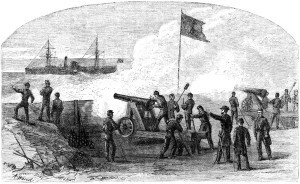 During this interview the firing from Moultrie and Sullivan’s Island had not ceased, though General Wigfall timidly displayed a white flag at an embrasure facing the batteries. Wigfall retired. A short time afterward a deputation consisting of Senator Chesnut, Roger A. Pryor, and two others, came from General Beauregard, and had an interview with Major Anderson. It then turned out that the officious Wigfall had “acted on his own hook,” without any authority whatever from his commanding General. After a protracted consultation and a second deputation, Major Anderson agreed to evacuate Fort Sumter the next day. This was Saturday evening. That night the garrison took what rest it could. Next morning the Isabel anchored near the fort to receive the gallant little band. The terms of evacuation were that the garrison should take of its individual and company property; that they should march out with their side and other arms with all the honors, in their own way, and at their own time; that they should salute their Flag and take it with them. With their tattered flag flying and the band playing national airs, these seventy heroes marched out of Fort Sumter. Seventy to seven thousand! Major Anderson’s heroic conduct had drawn all loyal hearts toward him, and it was the wish of the country that he should immediately be invested with some important command. He was made a Brigadier General and sent to Kentucky to superintend the raising of troops in that state. But the terrible ordeal through which he had just passed and the results of hardships undergone in Mexico, unfitted him for active duty. Since then, General Anderson has resided in New York City. A tall, elderly gentleman in undress uniform, leading a little child by the hand, is often seen passing slowly along Broadway. His fine, intellectual face is the index to the genuine goodness and nobility of his heart. Though men of noisier name meet you at each corner, your eyes follow pleasantly after this one—Robert Anderson. Be sure to visit U.S. History Images to see more images of the Fort Sumter Battle. Moore, Frank, ed. “The Fall of Fort Sumter: Heroes and Martyrs.” Fort Sumter Memorial. New York: Edwin C. Hill, 1915. 17-30. Print. Want to learn more about the Battle of Fort Sumter and the Start of the Civil War? Check out my new Kindle ebook on Amazon! In my quest to journey through images related to the American Civil War, I found myself fascinated with the actual history behind the images; so much of it I had either never learned or learned and forgotten. There are books by contemporary authors who write modern views of these historical events, and many of them are fantastic. But I was looking for history that was written closer to when the events occurred–eyewitness accounts, newspaper articles, speeches, etc. And so I started researching and reading and researching some more, scrounging the Internet to find everything I could about my first topic of interest: the Battle of Fort Sumter and the Start of the Civil War. Then I started thinking, maybe there are others like me–people who want to learn as much as they can about a specific moment in history. Most history books, even ones about certain time periods such as the American Revolution or the Civil War, are trying to cover so much that they are unable to do an in-depth report on a particular battle or general or theme of that time period. So I decided to create a compendium of literature that dealt with just one piece of the history pie. My goal was to collect and organize all the articles I had read into Kindle e-books that others could read and enjoy. And so I have published my first set of books through Amazon’s Kindle publishing platform. I am hoping that people will use them to get a in-depth view of the fascinating events surrounding the start of the Civil War. I’ve already started working on a series of e-books on another famous and horrifying battle. I can’t wait to share them with everyone. 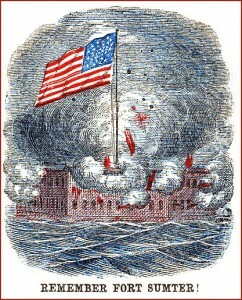 The fall of Fort Sumter on April 14, 1861 is the first success of the Confederacy, and it has two effects. For the secessionists, it rouses the spirit of the people. The number of recruits increases, money and jewelry are handed over to the Confederate Treasury, and women set to work to make clothes for their husbands and sons in the army. They imagine a glorious victory over the abolitionists of the north. In the North, the people awake to realize a terrible fact– the flag of their country has been assailed. Union meetings are held all over the North. The people decide that they must fight for that flag or the Nation’s life will end. Soldiers enlist and hasten to the front even before the State or Federal government can supply arms and equipment. Private individuals equip whole regiments, while private contributitons swell the Treasury. Workshops of the North run night and day to provide supplies and clothing for this great army. A political contest had divided the people of the North, but the firing on the flag of Fort Sumter unites them behind a common cause. It was said that when the Stars and Stripes went down at Sumter, it went up in every loyal town and county in the States. Every window-shutter is tied with red, white, and blue. Even dogs are wrapped in the star-spangled banner. The demand for flags is so great that manufacturers can not supply them fast enough. Party lines divided us, and we believed our differences were too radical for us to be united upon any question of national importance. We were a plodding, prosaic people, proud of our past, anxious for the present, uncertain of the future. When, lo! the shot on Sumter dispelled all doubt, dissipated all gloom, and transformed the nation. We trod a new earth, we breathed a purer air; a brighter heaven shone above us. The blood of our fathers coursed in our veins, and we knew it was for us they had suffered and died. The flag was no longer a mere historic emblem, it was a living principle worthy of the costliest sacrifice. We were no longer Whigs, Democrats, Republicans— we were citizens of a common country. We were living among heroes in a new heroic age. 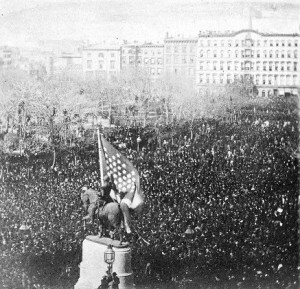 On April 20, 1861, a large assembly of people gather around the statue of George Washington in Union Square, New York. Places of business are closed, so that everyone can participate. It is estimated that at least one hundred thousand people are in attendance that afternoon. Four stands are erected at points around Union Square, and the soiled and tattered flag that Anderson brought away from Fort Sumter, mounted on a fragment of the staff, is placed in the hands of the equestrian statue of Washington. Upon the wings of the lightning it goes out throughout the world that New York, by one hundred thousand of her people, declares to the country and to the world that she will sustain the government to the last dollar in her treasury, to the last drop of your blood. The national banners waving from ten thousand windows in your city to-day proclaim your affection and reverence for the Union. During the course of the war, the U. S. Sanitary Commission, an official agency of the United States government comprised of women volunteers who want to contribute to the war effort, take the flag on a tour around the North. It is used as a fund-raising tool, and is “auctioned” off to the highest bidder, who turns the flag and the money back over to the commission so it can be auctioned again. On my return to Washington, I mentioned to President Lincoln and Secretary of War Cameron the fact of my having brought the Flag from Fort Sumter, and that it was securely boxed and stored in New York, and that I had never allowed it to be unboxed. I feel that no one can guard the sacred relic as I do, and it is my earnest desire that when Fort Sumter shall–by God’s blessing–be again our own I may be permitted by the government to then once more unfurl it; or should I die before that time, that it may be wrapped around my body when it is borne to its last resting place. Apparently, Anderson’s wish is granted, and he continues to be the flag’s guardian. But how could the Sumter flag travel the North and also be safely in the Major’s care? Well, it appears that there were at least two Fort Sumter flags. One word more. Let me tell you an incident. 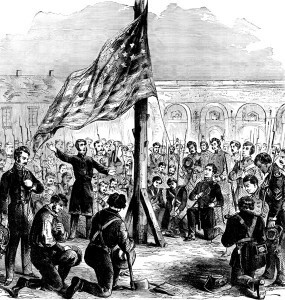 In Fort Sumter, two years ago, before the bombardment, General Anderson brought out the old flag that had been raised upon that flagstaff, and tied the halliard to the flag, and gathered his men around him, and asked the chaplain to kneel by the flagstaff and pray. He knelt with closed eyes, one hand above grasping the halliard, the other below, and thus kneeling there at the foot of the flagstaff, before God, the chaplain prayed that that flag might never be lowered in the face of the enemy. 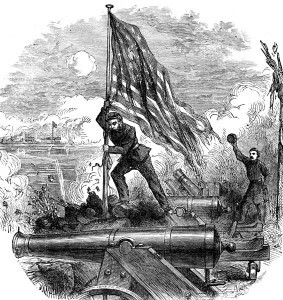 That at noon, on the 14th of April next, Major-General Anderson will raise and plant upon the ruins at Fort Sumter, in Charleston Harbor, the same United States Flag that floated over the battlement of that fort during the rebels’ assault, and lowered and saluted by him and the small force under his command when the works were evacuated April 14, 1861. So on the 14th of April, 1865, on the fourth anniversary of the evacuation of Fort Sumter, Brevet Major-General Anderson, by order of President Lincoln, raises that identical flag once more over the ruins of Fort Sumter. Five thousand soldiers, sailors, and citizens assemble in the battered and shapeless fortress. A prayer is given by Reverend Matthias Harris, the same chaplain who had delivered the prayers at the raising of the flag on Fort Sumter in December, 1860. I am here, my friends, my fellow-citizens and fellow-soldiers, to perform an act of duty to my country dear to my heart, and which all of you will appreciate and feel. Had I observed the wishes of my heart it should have been done in silence; but in accordance with the request of the Honorable Secretary of War, I make a few remarks, as by his order, after four long, long years of war, I restore to its proper place this dear flag, which floated here during peace before the first act of this cruel rebellion. Anderson then pulls the halyards and sends the tattered banner up the staff. A one-hundred gun salute is given followed by a national salute from every fort and battery that fired upon Fort Sumter in Charleston Harbor. 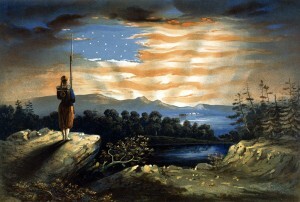 On this solemn and joyful day, we again lift to the breeze our fathers’ flag, now, again, the banner of the United States, with the fervent prayer that God would crown it with honor, protect it from treason, and send it down to our children, with all the blessings of civilization, liberty and religion. Terrible in battle, may it be beneficent in peace. 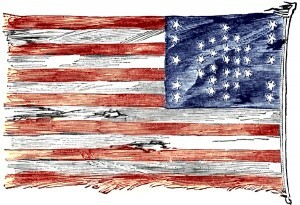 When Anderson dies in 1872, the flag is wrapped around his casket as it travels from New York to West Point for burial. Every officer and man present had battled and endured in the trenches of the sea islands, or had done service in the vessels of the navy before Charleston Harbor or off Fort Sumter. 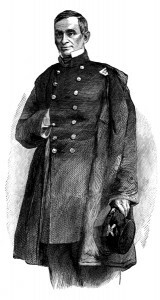 General Stewart L. Woodford, afterwards our Minister to Spain, presided. That identical flag, which had been lowered by General Anderson in 1861, and raised by him again in 1865, and which had not afterwards been seen in public since it was wrapped about his coffin in 1871, was once more exhibited, by the favor of Mrs. Anderson, who had it in keeping. It was stretched across the platform behind the patriotic speakers. Its rents from shot and shell were more eloquent than Caesar’s gaping wounds, telling their story by their “poor dumb mouths.” It was accompanied to that gathering, at the special request of Mrs. Anderson, by members of the old Anderson’s Zouaves as a body guard of honor. As one and another of the officers who spoke pointed to that old flag, and reminded us all of what it had stood for, and of what it had cost, in those four years of war, to restore it to its rightful supremacy, the scene was dramatic and impressive. All realized the worth of that flag, and the value of the efforts to restore its supremacy. When Mrs. Anderson passes away in 1905, the flag is presented to the United States War Department, as stipulated in Mrs. Anderson’s will. For a time, the flag is displayed in the office of the Secretary of War in Washington, enclosed in a mahogany case, carefully folded and tied with bands so as to show as much of the flag and as little of the bullet holes as possible. The Fort Sumter Flag can currently be seen in the museum at the Fort Sumter National Monument, an enduring symbol of the trials that so many faced during the American Civil War. Harrison, Peleg D. The Stars and Stripes and other American Flags. Boston: Little, Brown, and Company, 1914. Leepson, Marc. Flag: An American Biography. New York: Thomas Dunne Books, 2005. Moore, Frank, ed. Fort Sumter Memorial. New York: Edwin C. Hill, 1915. Preble, George Henry. History of the Flag of the United States of America. Boston: A. Williams and Company, 1880. The Royal National League. Opinions of Loyalists Concerning the Great Questions of the Times New York: C. S. Westcott & Company, 1863. Smith, Colonel Nicholas. Our Nation’s Flag in History and Incident. Milwaukee: The Young Churchman Company, 1903. Smith, Percy F. Memory’s Milestones: Reminiscences of Seventy Years of a Busy Life in Pittsburg. Pittsburg: Murdoch-Kerr Press, 1918. Major Anderson (seen to the left) and his men work at the fort for three months, knowing that their provisions are running out and that starvation awaits them if they are unable to obtain supplies. Another attempt to resupply the fort also fails. Behind the fortress wall, the men watch as the military and batteries around Charleston Harbor build up their forces and prepare for action. On April 11, 1861, General Beauregard of the Confederate Army, sends messengers to request, once again, the surrender the fort. Anderson promptly refuses. He is then notified that shelling will commence the following day. The bombardment against Fort Sumter by Confederate forces begins on April 12th, 1861, at 4:20 a.m. Mortar from Fort Johnson is heard first; then, the great guns of Morris Island open fire. Anderson waits until 7 a.m. to respond to the attack. The first shot is sent by Captain Abner Doubleday towards the battery on Morris Island. For four hours the combat continues. Guns at Fort Sumter are disabled; the barracks are set on fire. The bombardment goes on throughout the night as a storm rages, preventing reinforcements in the harbor from getting to the besieged fort. On the morning of the 13th, salted pork is the only food left for the men to eat, but a fire consumes even those meager reserves. To prevent an explosion, ninety barrels of gunpower are rolled into the water. Heat and smoke are stifling in the fort, yet the exhausted soldiers keep the old flag flying. The insurgents appear to aim their artillery directly at the flagstaff. Eight times the staff is hit without serious injury, but after two days of incessant firing , the flagstaff is finally shot away. The flag falls to the ground among the burning embers of the fort. The Confederates take the sudden disappearance of the flag as a sign of surrender. When Peter Hart, a trusted friend and advisor to Major Anderson, notices that the Stars and Stripes has fallen, he quickly refastens it to a piece of the staff and places it at the highest part of the remaining ruins of the fort, where it continues to fly defiantly. Matters had evidently reached a crisis for the men within the walls of Sumter. Fearing that some terrible calamity might befall them, and being informed that the United States flag no longer floated over the fort, General Beauregard immediately dispatched three of his aids, with their offers of assistance to Major Anderson, who thanked him for his courtesy, but declined to accept aid. Before General Beauregard’s aids could get to the fort, the United States flag, which had not been hauled down, as we supposed, but had fallen from the effects of shot, was hoisted anew. Early in the faternoon of the 13th, ex-Senator Wigfall of Texas arrives at the fort and is met by Captain Foster, and Lieutenents Meade and Davis. Throughout the siege, Anderson refuses multiple requests to surrender. The Fort Sumter Battle lasts thirty-six hours, with over 3,000 shot and shell hurled upon the fort. It is not until they are out of food and resources that Andersons agrees to evacuate . The terms of the evacuation are that the garrison will take their individual and company property and march out with their side and other arms, with the honors of war, in their own way and at their own time, and that they should salute the flag and take it with them. The insurgents agree to these terms, and agree to take Major Anderson and his men to any part of the country, either by land or water. When the baggage of the garrison is all on board the transport, a portion of the soldiers remain inside, under arms, to serve in saluting the American flag. Sadly, during the fifty gun salute, one man is killed and three more are injured. When the last saluting gun is fired, the flag is lowered amid the cheering of the men. The band plays “Yankee Doodle” and “Hail to the Chief,” as the garrison marches out. The fortress has been evacuated but not surrendered. Anderson departs from Fort Sumter aboard the Baltic, which proudly flies the Fort Sumter flag, and sails for the North. When the Baltic enters New York Harbor on the 18th with the flag waving, it is greeted by salutes from the forts and the cheers of thousands of spectators who have gathered to welcome its defenders. 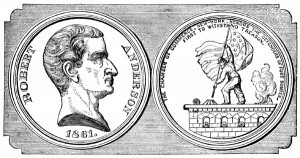 Major Robert Anderson keeps the flag, at the request of Secretary of War Simon Cameron, and places it in the vaults of the Metropolitan Bank in New York City. Be sure to visit U.S. History Images to see more Fort Sumter Pictures. Lossing, Benson. Harper’s Encyclopedia of United States History. New York: Harper and Brothers Publishers, 1912. Mottelay, Paul F. and T. Campbell Copeland. The Soldier in Our Civil War. New York: Stanley Bradley Publishing Company, 1885. It’s December, 1860. Major Robert Anderson is commanding a small group stationed at Fort Moultrie in Charleston Harbor, South Carolina. He is worried that the Southern Confederacy is going to seize Fort Sumter, another fort in the harbor. He knows that Fort Sumter is stronger than the one he is currently occupying. He is convinced that if the South takes control of Sumter, all the other forts in the area will be captured as well, so he resolves to move his troops to Fort Sumter while he still can. On the night of December 26th, under cover of darkness, Major Anderson evacuates his garrison of sixty to seventy men, along with the women and children, onto three small vessels and gets them safely within the strong granite walls of Fort Sumter. The next day, December 27th, at noon, the national flag that was carried from Fort Moultrie, is raised upon the flag-staff of Sumter. Everyone gathers around the staff. Major Anderson kneels while the Reverend Matthias Harris says a prayer asking for encouragement, support, and mercy. 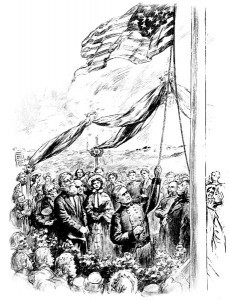 Anderson pulls the cord and hoists the Fort Sumter flag to the top of the flag pole as a band plays “Hail Columbia.” Soon the people of Charleston can see the stars and stripes floating above the fort, and they wonder what Robert Anderson will do next. When Governor Pickens discovers that Major Anderson has moved his garrison to Fort Sumter, he immediately demands Anderson’s withdrawal. This request is politely refused, and Anderson, a native of the slave-labor state of Kentucky, is denounced throughout South Carolina as a “traitor to the South” and treated as a public enemy. On January 9th, 1861 President Buchanan sends an unarmed steamer, The Star of the West, to Fort Sumter in an attempt to replenish the garrison with badly needed supplies, food, and men. However, Cadets from The Citadel stationed on nearby Morris Island, fire upon the ship as it enters Charleston Harbor, forcing its return home. These are considered the first shots fired in the American Civil War. Governor Pickens sends his Secretary of State and Secretary of War as commissioners to Anderson on the 11th of January and make a formal demand for the surrender of the fort to South Carolinian authorities. Anderson replies that he would sooner blow-up the fort and garrison than suffer such a humiliation. Welcome to my new blog! I’ve been wanting to have a blog to go with my main U.S. History Images site ever since I created it about three years ago. Wow! I can’t believe I’ve been working on it for that long! It doesn’t seem like it’s been three years since I’ve been scanning and adding images. My collection of United States history books has really grown over the years. My husband, a fabulous furniture maker, finally designed and built me a huge set of bookcases. (I guess he’d had enough of my whining!) But they’re already full! What’s a book addict to do? One of the delightfully unexpected side-effects of this project is everything I’m re-learning about American history. There are so many fantastic stories of people and places and events that I never learned about, or learned about and forgot. So my goal for this blog is to share two types of stories: the stories of my process in creating the web site and the stories that I discover about United States history as I go along. Coincidentally, the next set of images that I’m preparing concerns the Civil War. This seems very apropos, considering this is the Rebellion’s sesquicentennial. When the war first started, the common wisdom was that it would only last a few months. I feel the same way about this project. It’s definitely taking me a lot longer to complete than I imagined. More about that in my next post. © U.S. History Images 2019 - Powered by WordPress - Theme RedBel by Belouga.